Slice off the top one-third of each apple. Using a small teaspoon or grapefruit spoon, core-out the center of each apple base (working outward from center-most part of fruit), leaving ¼-inch outer edge. In a small bowl, mix the tuna, mayonnaise, mustard and carrot. Season to taste with salt and pepper. 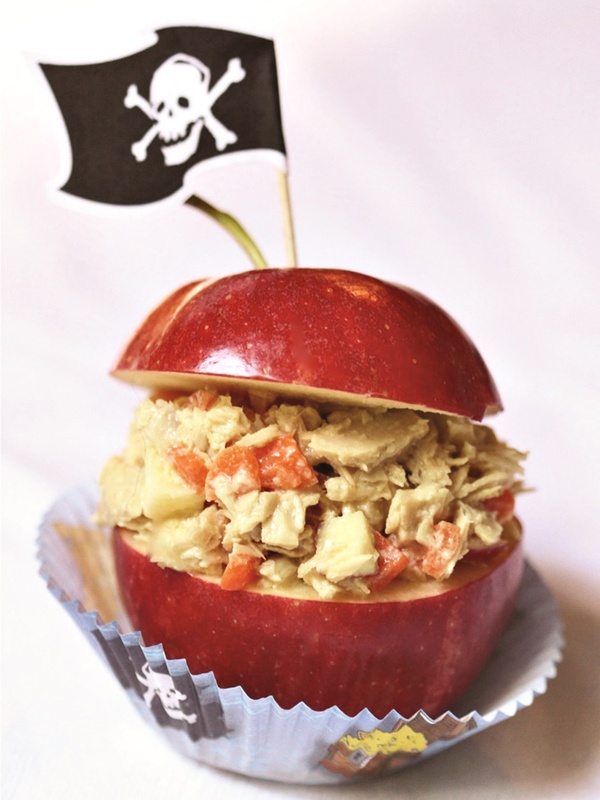 Spoon ¼ cup of the tuna salad into each apple, top with the top one-third of apples, tilted slightly to resemble a chest being opened. Use playful, pirate-themed cupcake holders and flagged toothpicks to make for fun presentation and easy clean-up, if desired. *For a vegan version, substitute mashed chickpeas (drained) for the tuna and use a vegan mayo and lightly sweet vegan mustard.